News that mega pop group SMAP was allegedly breaking up sent shockwaves across Japan this month. What made the unit what they are today, and why are the Japanese people so invested in this group, whose members are now in their 30s and 40s? I went back to their roots to find out. In a small alley on the edges of Tokyo's Shinjuku Ward is a small Japanese-style pub called Hotaru (Firefly). 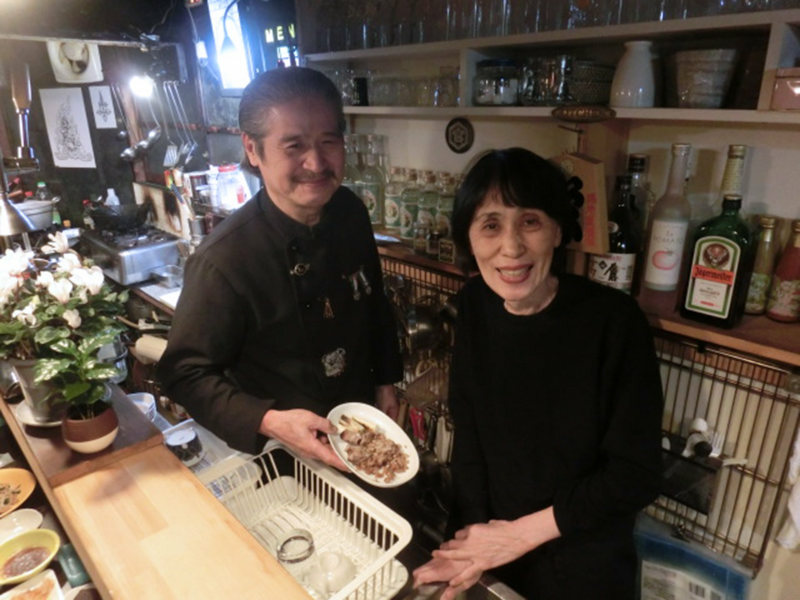 On the other side of the counter is the mustachioed proprietor Kitetsu Ishiyama and his wife, Hideyo. Not only do they serve up delicious fare, they're walking encyclopedias of the Japanese entertainment world. In the early 1980s, the couple ran an okonimiyaki (Japanese savory pancake) restaurant named Bulldog, in front of Togo Shrine in Tokyo's Harajuku district. The establishment had a tiled counter and just three tables. One night, Johnny Kitagawa, the founder and president of talent agency Johnny & Associates Inc., now 84, happened to come through the doors. "He was wearing a white dress shirt and gray slacks," Hideyo recalls. "I didn't think much of him; assumed he ran a small company or something." From that day onward, Kitagawa began to drop by from time to time. After a while, he also brought the members of SMAP, who were living in a dormitory nearby. "It was always around 10:30 at night. They'd order Coca Cola and chow down on okonomiyaki and fried noodles. (Takuya) Kimura took to me, saying, 'Auntie, I'm from Chiba,'" Hideyo says. "Johnny would also come by alone, and take out okonomiyaki. That was probably for those boys, who'd probably have been exhausted from dance practice." "They probably preferred this kind of soul food compared to expensive restaurant fare," Kitetsu says. "I never really spoke in depth with Johnny. But I'm a second-generation Korean resident of Japan, and I've always felt out of place. And I'm just guessing, but maybe Johnny felt that way, too, caught between Japan and the U.S."
Once the couple moved their restaurant to nearby Aoyama district in 1995, it was Johnny's older sister and vice-president of Johnny & Associates, Mary Kitagawa, now 89, who became a regular. The late actor Ken Takakura would also visit the restaurant from time to time. It's winter in Yoyogi Park, in Tokyo's Shibuya Ward. The park was once the athletes' village for the 1964 Tokyo Olympics; just one building remains from that time -- a peppermint-colored bungalow. Under the Allied Occupation following the end of World War II, the area had been a residential area for U.S. military personnel and their families, called Washington Heights. After the land was returned to Japanese authorities, the buildings were used to house athletes in the Tokyo Olympics. And Johnny Kitagawa, for a short period before the land was returned to Japan, had been a resident of Washington Heights. Back then, Kitagawa organized baseball teams of neighborhood boys so they could play on the grounds of Washington Heights. That was where Kitagawa discovered Teruhiko Aoi and the three other members of what would become the first boy band Kitagawa produced: Johnnys. The year was 1962. According to the non-fiction book "Washington Heights: GHQ ga Tokyo ni kizanda sengo" (Washington Heights: the postwar that GHQ imprinted onto Tokyo) by journalist Satoko Akio, Kitagawa was born in Los Angeles; his father was a priest at a branch of Koyasan Buddhist Temple there. The family moved to Japan in 1933, but after the end of World War II, Johnny Kitagawa once again crossed the ocean to Los Angeles. There, Kitagawa is said to have invited the singer and actress Hibari Misora to perform a show for Japanese Americans in the main hall of the temple his father had built. In 1952, Kitagawa crossed the ocean once again to the Korean Peninsula as an American soldier. Some say he taught English to children orphaned by the war, but his mission in the service remains unclear. Having been exposed to the entertainment industry in the U.S., Kitagawa appeared to cultivate a desire to develop a boys' version of Takarazuka Revue theater troupe. In 2012, on the 50-year anniversary of the birth of the first Johnnys, I asked to interview Kitagawa as a man who gave hope to war-torn Japan. My wish unfortunately did not come true, but my interest in his colorful life has not waned. Named by Kitagawa, the one-time boy band at the center of the most recent controversy, SMAP, stands for "Sports Music Assemble People." Indeed, sports and music do bring people together -- what the Japanese in the postwar era became most fanatical about were American-style pro baseball and pro wrestling. But SMAP, who debuted in 1988, did not shoot to stardom right away, as many of Kitagawa's other groups had. "Major music shows on television had just been terminated around that time," points out sociologist Shoichi Ota, who wrote the book, "Nakai Masahiro to iu ikikata" (The Masahiro Nakai way of life), "so their debut single didn't make it to the top of the charts. It took the group three years for them to get to No. 1. And where they found themselves after such a difficult struggle was not a world where 'idol' groups were considered princes, but variety shows, in which they were expected to expose their natural selves. They made the decision to do so, which led them to be as funny and as witty as comedians." While it has been announced that the group will stay together, ever since initial reports that the group may split made the rounds, the Japanese archipelago has not been thrown into chaos, but rather, it feels like it's been holding its breath. What does SMAP mean to the Japanese people? "I think the key word here is 'uneasiness,'" Ota suggests. "When they appeared on the scene, the Berlin Wall had come down, Japan's economic bubble had burst, the Showa Era had ended, and the public had this vague sense of being ill at ease. There is a lot in common between the group's struggles in the entertainment world and the general public's struggles in the real world. 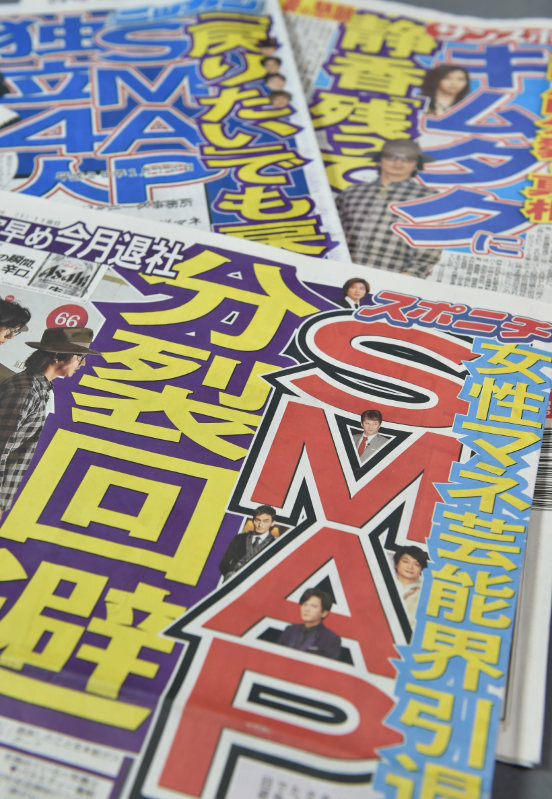 Because the Japanese people feel that they shared these trials and tribulations, they were stumped by the sudden news that SMAP could be no more. There's been a move among SMAP fans to buy multiple copies of the 'Sekai ni hitotsu dake no hana' (The one and only flower in the world) CD, and I think it's a way of fans giving something back to SMAP for helping them get through the hard times."